1. The approach is 3.6 miles before the ascent of either Mt. Hancock or South Hancock begins. 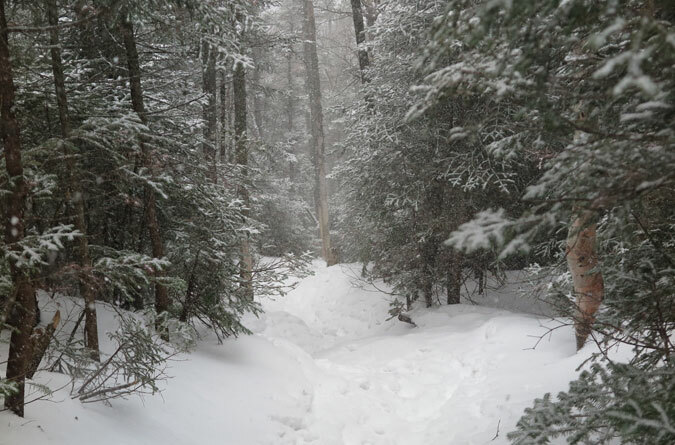 If you’re an early riser who loves breaking trail after a snowstorm, grab the snowshoes and have at it! If that doesn’t sound like fun, then you might want to avoid this one the day after a storm. It will get quickly packed. The approach to the Hancocks is long but mostly flat. 2. 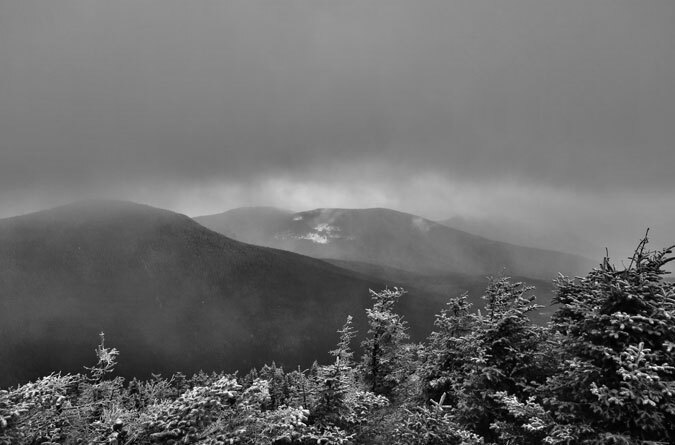 The hike encompasses segments of the Hancock Notch Trail and the Cedar Brook Trail, as well as all of the Hancock Loop Trail. 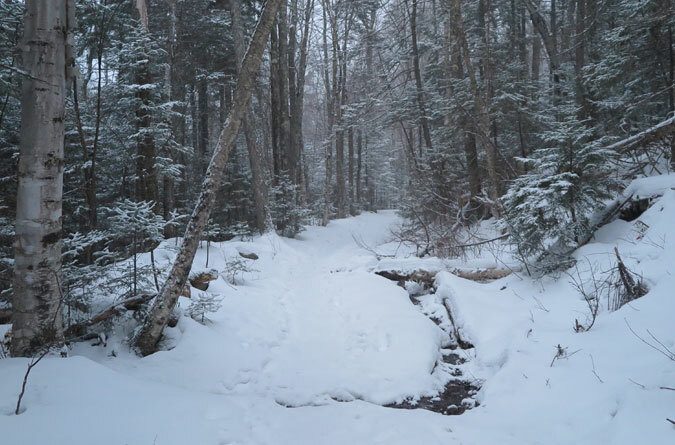 The route to the loop trail is typically well packed and easy to follow, but if you’re the lucky one breaking trail, you’ll want to pay attention at the junctions to make sure you’re going the right way. Read the trail signs carefully as it could be easy to confuse the Hancock Notch and Hancock Loop options on the signs with a cursory glance. 3. There are several stream crossings. 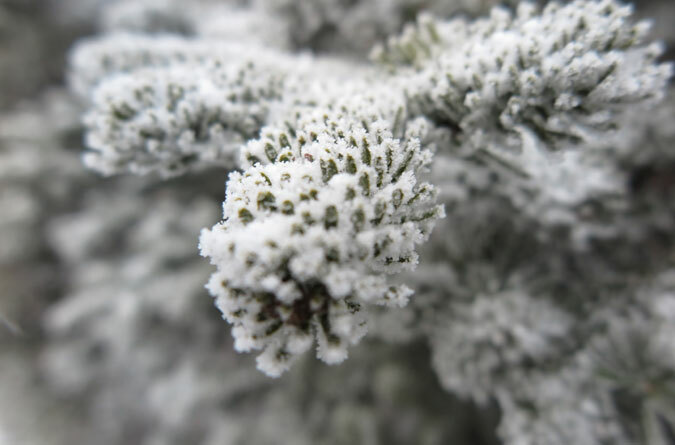 These aren’t a deterrent in the winter as they’re easy to rock hop, or are frozen over, but this is something to consider in the spring when water levels are high. 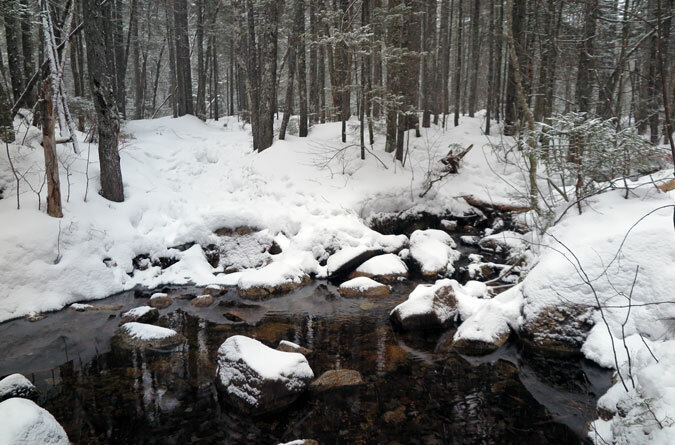 This stream was the trickiest of the crossings, and it’s an easy ford via a log above this pool. 4. The ascents/descents of the North and South peaks at either end of the loop are short but seriously steep. You’ll need traction and likely more than microspikes in most conditions. 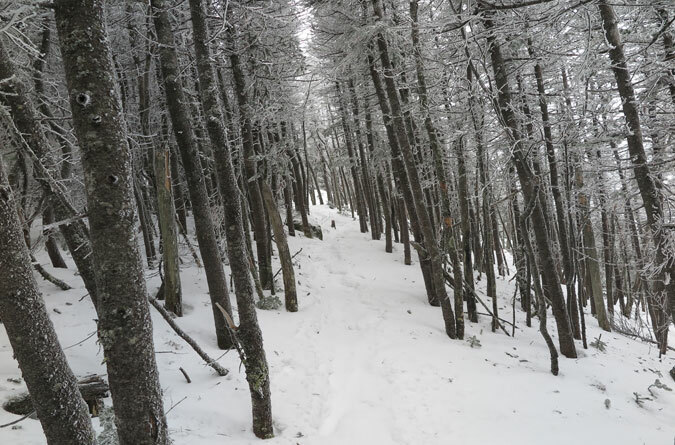 Winter hiking is all about conserving energy, so I utilized snowshoes with the heel bar up for the ascent and then switched to full crampons to avoid snowshoe-skiing on the descent. 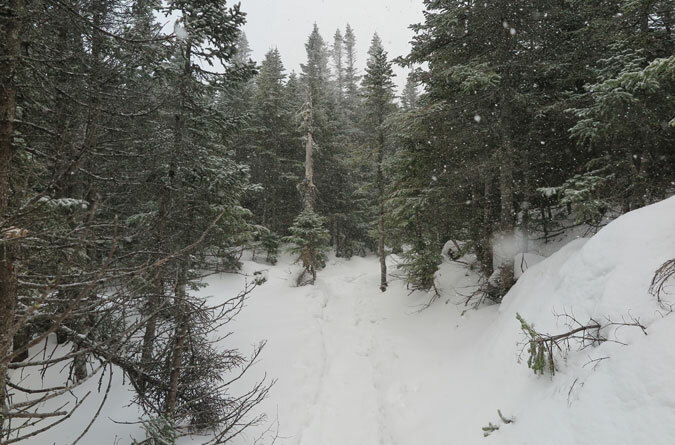 This strategy worked well for me, but on a well-packed trail day, you could easily view it as a crampon-only hike and keep the snowshoes in the car to save weight and conserve energy that way. To each their own. A shot of the steep climb to Mt. Hancock on a clockwise loop. A mountaineering axe could be used on the steep sections of this hike, but I found trekking poles with winter baskets to be adequate. That said, the slopes on this hike would be a good place to practice mountaineering footwork and axe usage—just not self-arrests, too many trees! In regards to preferred loop direction, I don’t think it matters. 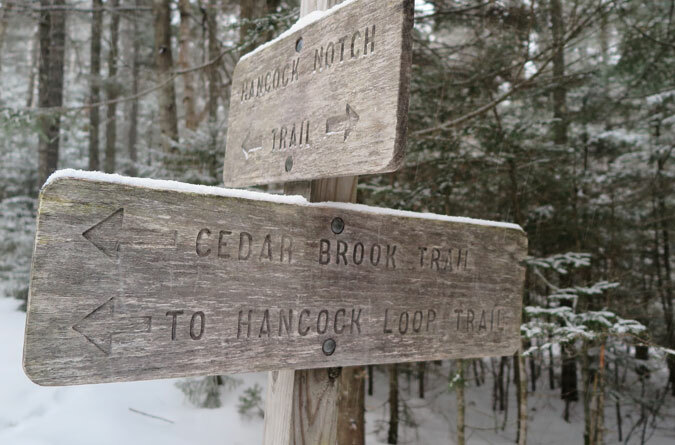 On a map, it’s 0.2-miles longer from the trail split to Hancock’s North Peak than it is to the South Peak; however, there’s easily 0.2 miles of casual hiking on the north ascent, so there’s no real difference in the steep portions. There’s a good outlook just off the main summit; however, on this day I couldn’t see much past South Hancock as seen here on the left. From the main summit to South Hancock, the ridge hike in between is 1.4 miles of wooded trail with no real views until a lookout below the South Peak. There’s enough elevation gain/loss between the two peaks for them to both count on the White Mountains 48 list, but it’s barely noticeable. 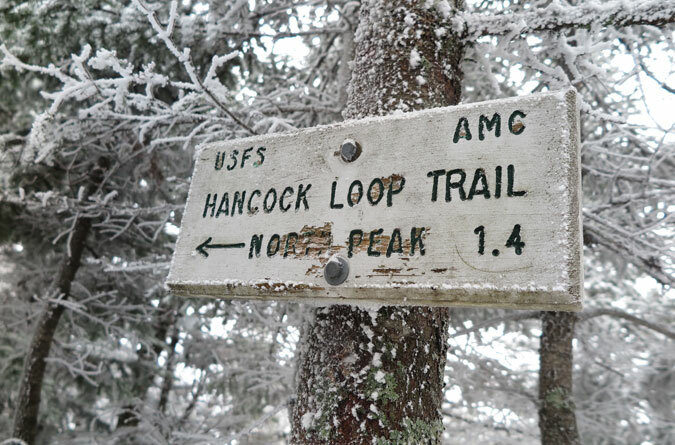 A stretch of the Hancock Loop Trail between the summits. A cool-looking corridor of trees just before Mt. Hancock’s South Peak. As the sign says, it’s 1.4 miles of forested ridgeline between the peaks. 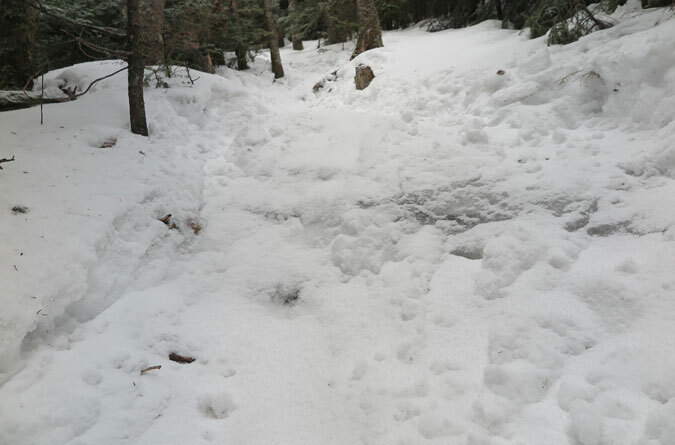 The steep descent of the Hancock Loop Trail from the South Peak. As always, it’s much steeper than this image makes it look. That’s it for this post — happy trails!